Home Health The Delta Aquariids meteor shower peaks this weekend. Here’s how to watch. When Earth passes through the trail of debris left behind by a comet, bits of that debris catch fire in our atmosphere and streak across the sky at a blazing 3,000 degrees Fahrenheit. On the nights of July 27 and 28, you can look up and see this celestial show during the peak of the annual Delta Aquariids meteor shower. The shower might not be quite as spectacular as the Perseid meteor shower, still to come on August 11 to 13, but it will be worthwhile to stay up late Saturday and gaze toward the sky. How do you find it? The meteorites will appear to radiate out of the star Delta Aquarii, in the constellation Aquarius (which takes the form of a guy pouring out a jug of water). Use a smartphone app like Sky Guide to find out precisely where to look where you live. Aquarius will rise in the late evening (after 11 pm) in the southeastern sky. The meteors will be easier to spot the later it gets in the night, as Delta Aquarii rises higher and higher. NASA notes this meteor shower usually produces around 20 meteors per hour at its peak. 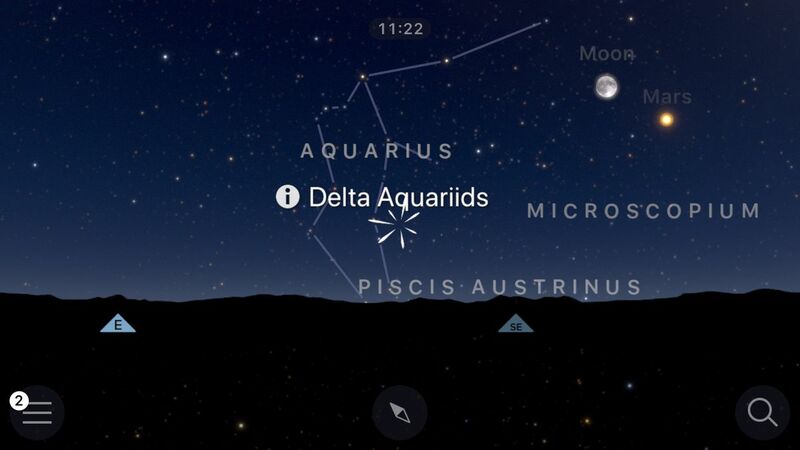 You don’t need to be looking directly at Delta Aquarii to see them, as they’ll radiate out in all directions across the sky. A bright full moon could obscure some of your chance of seeing them, however. Though the show is peaking on July 27 and 28, Earthsky reports a few Delta Aquarid meteors may be seen each night until late August, and that they’re best viewed after midnight. If you can’t spot the meteors, at least you’ll get a great view of Mars. That’s because on July 27, the sun, the Earth, and the planet Mars will line up for a once-in-two-years treat called “Mars in opposition.” It’s a chance to see the red planet in big, bright detail in the night sky. The opposition also occurs just a few days before Earth and Mars reach their closest approach to one another — July 31. This makes Mars appear slightly bigger in the sky than it normally would. In any case, (unless you’re expecting clouds and rain), you’re bound to spot something cool by staring at the stars Saturday night. Previous articleIs Gwyneth Paltrow’s Goop pseudoscience winning?